Yesterday, very hungover from a 40th birthday party on Saturday night, I met up with a bunch of lovely girls I used to work with for lunch at The Cottage in Balmain. Being a grey, drizzly day (and hungover) I am hoping for a warm, cosy place with comforting food, and I’m not disappointed. The Cottage (in fact a charming terraced house with a little front garden) has a homely mix of wooden farmhouse-style tables and chairs, and coffee tables circled by mismatched arm-chairs and sofas upholstered in brightly coloured florals and plaids. Our table is one of the latter. Nursing a large glass of reviving bubbly mineral water in my case, my companions and I peruse the menu and order a selection of share plates, all of which arrive on wooden chopping boards (so à la mode). 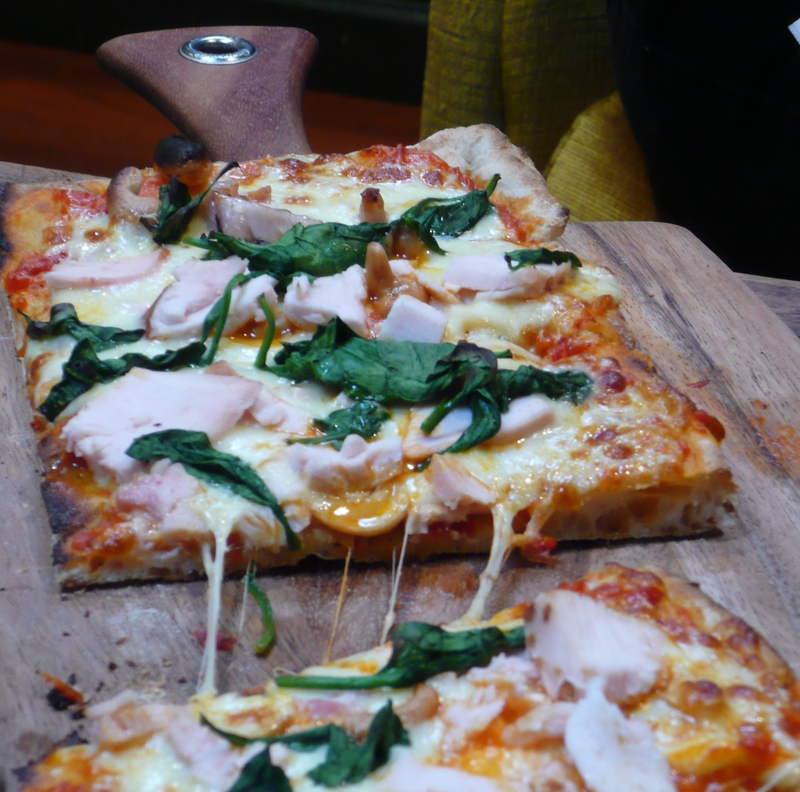 Wood fired pizza with smoked chicken, baby spinach, cashews and capsicum purée is tasty with tender chicken and stretchy mozzarella, and reasonably substantial on a crisp but thickish base. 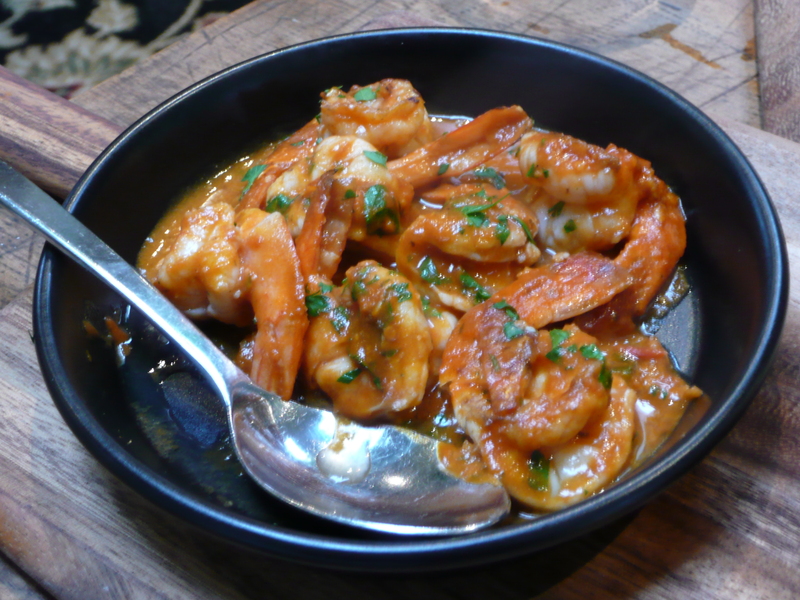 Garlic prawns are small and slightly overcooked but are smothered in plenty of tomatoey, mildly spicy sauce with chopped fresh herbs. 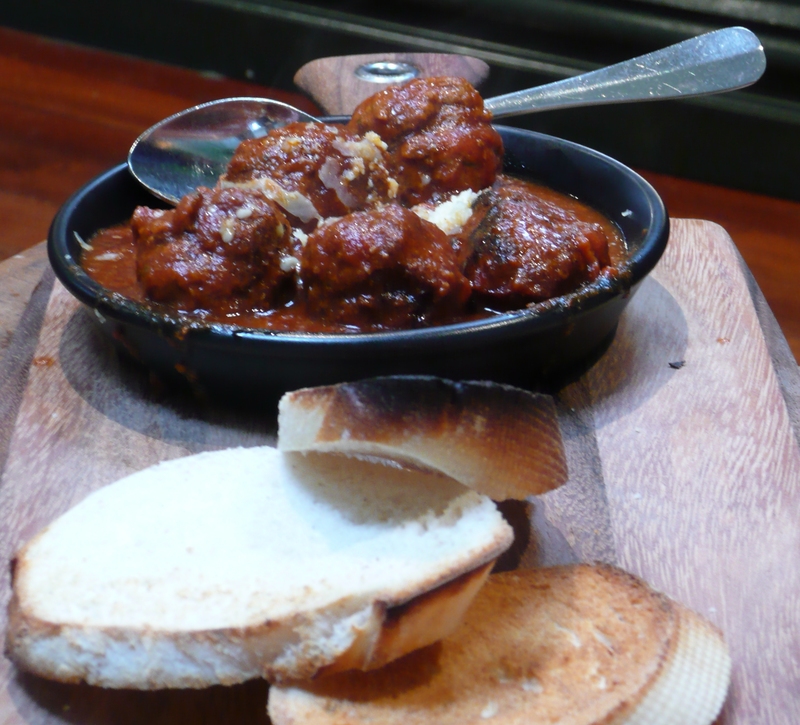 Traditional Italian meatballs are rather dry inside but, again, the tomato sauce is darkly rich and delicious and sprinkled with grana padano. Zucchini fries are battered and in need of salt but the aoili is good and garlicky. The dessert menu includes just three choices and to our great disappointment the Spanish churros have run out! 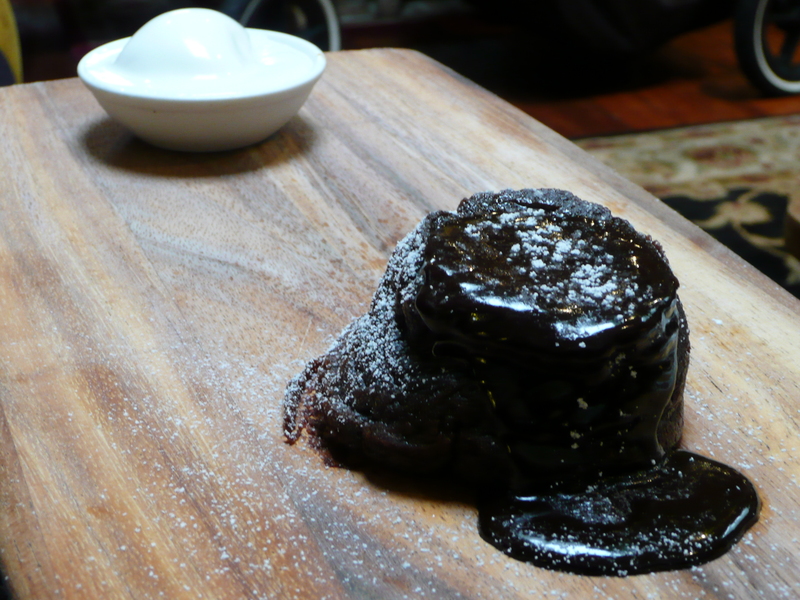 We go for chocolate pudding with vanilla bean ice cream, and mixed berry and apple crumble, also with ice cream. 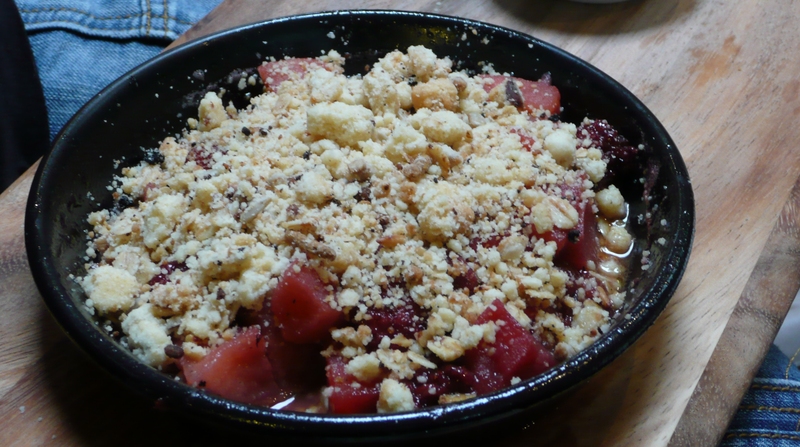 They’re both quite satisfying: the chocolate pudding is pleasingly chocolatey (for not all are) and gooey with a bouncy texture, the fruit crumble topping is crunchy with toasted oats. The ice cream (which is the same for both dishes) is a bit anemic and lacking in vanilla seeds. The food here is good without being great but this is compensated by the comfortable surroundings and the friendly service. It strikes me that this place would be better suited to roasts, shanks and sausage and mash than bar-food type share plates, but that could have been down to the hangover. Did I mention I was hungover?